Enjoy Better Life I Can See Clearly, Wow! . Streak Free And Film Free: Specially Formulated For Glass And Reflective Surfaces. Works On Glass, Windows, Mirrors, Plexiglass, Auto Glass, Treated Windows, Light Fixtures, Chrome And Acrylic. 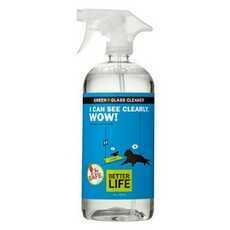 Easily Removes Soils That Accumulate On Glass: Fingerprints, Nose Prints And Grime. Free Of Vocs, Alkyphenol Surfactants, And PetroleumNot Tested On Animals (Note: Description is informational only. Please refer to ingredients label on product prior to use and address any health questions to your Health Professional prior to use.